The first day of Focus on Imaging is over. My new City Light book was officially launched. We saw lots of old friends and met many new ones. I took some photos on my mobile of the stand before the show started and expected to do this post shortly afterwards. We were busy from the start so just finding the time now at almost midnight. Still 3 days to go. 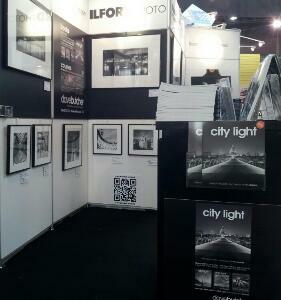 We are on the Ilford Photo stand C2 hall 9 at the Birmingham NEC. Discounts on books and courses. Ilford/Harman have big show discounts on film, paper and inkjet media if you can get down here. Also a new low priced pinhole camera, obscura, as well as the Titan pair of pinholes for 5×4 and 10 x 8 in. There is even a full blown darkroom with a film processing machine, an enlarger and a paper processor. Staying with good friends Peter and Sally and their family in Kenilworth. Lot more enjoyable than the normal NEC show!